parameters tuning/optimization is usually not possible on the real hardware. For all these reasons, the design of these robot controllers can benefit from being first performed in simulation, with the purpose to port them later to the real hardware. Very fast simulators of humanoid robots were implemented taking advantage of the symbolic approach of Robotran. 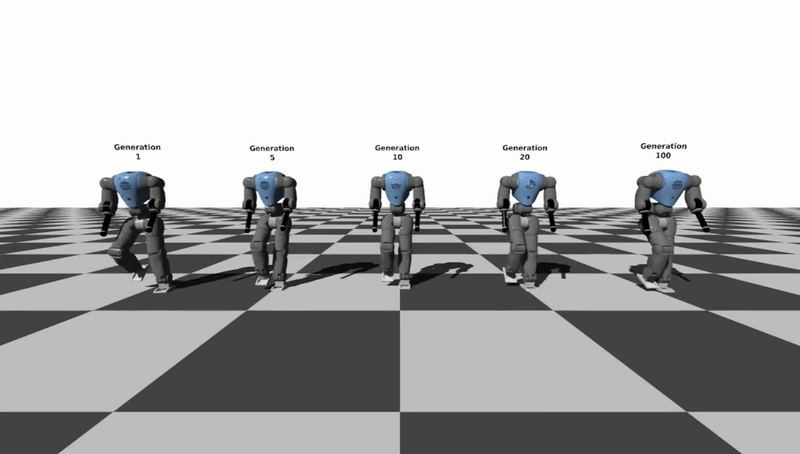 Thanks to the simulators, controllers were designed to obtain bio-inspired locomotion and gaze stabilization algorithms on different humanoid robots. For instance, regarding the design of the bio-inspired gaits, the related controllers recruited many unknown parameters, which were tuned during extensive optimization processes using the Robotran simulator. Your navigator does not support this video format. The bio-inspired locomotion controller of COMAN recruits many unknown parameters. These parameters are optimized over successive generations in the Robotran simulator using a Particle Swarm Optimization algorithm. The COMAN walking controller is first designed and optimized in a 2D simulation environment (i.e. with lateral support) in Robotran. The exact same controller is then ported to the real platform without further parameters modification. 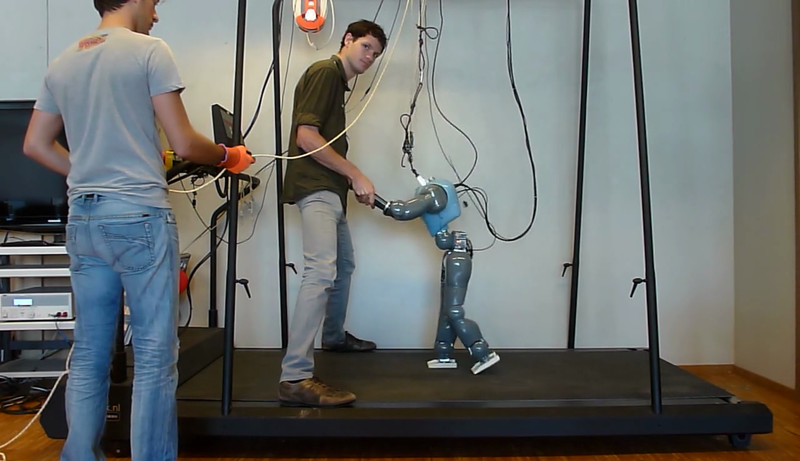 More information about locomotion control for humanoid robots on the homepage of Nicolas Van der Noot. Git repository of the simulator of the COMAN humanoid robot: https://git.immc.ucl.ac.be/nvandernoot/coman_robot. Zobova AA, Habra T, Van der Noot N, Dallali H, Tsagarakis NG, Fisette P and Ronsse R (2017) Multi-physics modelling of a compliant humanoid robot. Multibody System Dynamics 39 (1-2), pp. 95-114. DOI: 10.1007/s11044-016-9545-4. Van der Noot N, Colasanto L, Barrea A, van den Kieboom J, Ronsse R and Ijspeert AJ (2015) Experimental validation of a bio-inspired controller for dynamic walking with a humanoid robot. In: 2015 IEEE/RSJ International Conference on Intelligent Robots and Systems (IROS), Hamburg, Sept. 28 2015-Oct. 2 2015, pp. 393-400. DOI: 10.1109/IROS.2015.7353403. Van der Noot N, Ijspeert AJ and Ronsse R (2015) Biped gait controller for large speed variations, combining reflexes and a central pattern generator in a neuromuscular model. In: 2015 IEEE International Conference on Robotics and Automation (ICRA), Seattle, WA, 26-30 May 2015, pp. 6267-6274. DOI: 10.1109/ICRA.2015.7140079. Heremans F, Van der Noot N, Ijspeert AJ and Ronsse R (2016) Bio-inspired balance controller for a humanoid robot. In: 2016 6th IEEE International Conference on Biomedical Robotics and Biomechatronics (BioRob), Singapore, 26-29 June 2016, pp. 441-448. DOI: 10.1109/BIOROB.2016.7523667. Colasanto L, Van der Noot N and Ijspeert AJ (2015) Bio-inspired walking for humanoid robots using feet with human-like compliance and neuromuscular control. In: 2015 IEEE-RAS 15th International Conference on Humanoid Robots (Humanoids), Seoul, 3-5 Nov. 2015, pp. 26-32. DOI: 10.1109/HUMANOIDS.2015.7363518.